This guest post was written by Tracyanne Roberts, the Education and Public Outreach (EPO) Coordinator for CalTech/IPAC. Tracy is the lead on a NASA Universe of Learning project called STEMdex, a project to streamline access for the astronomy EPO community and improve knowledge of published STEM (Science, Technology, Engineering, and Math) education research literature. How smart are you? Did you get where you are today by sheer brilliance, or due to copious hard work? When did you become a science geek? And hey — are you a nice person? Perhaps not a surprise — but your answer to these questions likely depends upon your gender. Even more distressing, it is likely you formed views of your intelligence before you finished kindergarten! And furthermore, whether or not you became a scientist was likely set before you finished middle school. Such are the results from two recently presented papers that examine student attitudes about brilliance and scientific interest. 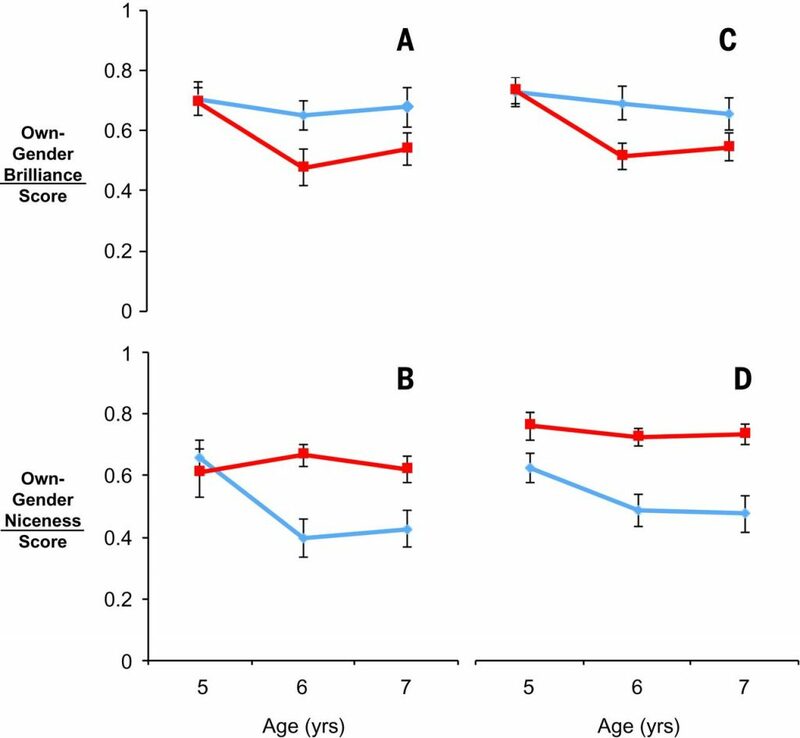 The first paper points to the startling supposition that, at the grand old age of 6, girls begin to view their own gender as less intelligent than males and begin to alter their activities and interests accordingly. The second paper strongly points to students’ interest in science being set between the ages of 10 and 14. These papers jointly support the notion that very young children begin to alter their interests and activities based upon stereotypes, and that by age 14, individuals have largely developed toward becoming a science enthusiast … or not. Common stereotypes associate high-level intellectual ability (brilliance, genius, etc.) with men more so than with women (and it seems that most people associate being nice with being female, by the way). A new study has found that by age 6, girls are less likely than boys to believe that females are “really, really smart.” Also at that time, girls begin to avoid an activity if told the endeavor is for smart people. “Gender Stereotypes About Intellectual Ability Emerge Early and Influence Children’s Interests” suggests that children acquire stereotypes about brilliance during first grade and that immediately begins to affect their interests. Tragically, the slight differences in daily choices about games and activities can accumulate over years, leading to life-changing gender gaps in experience and knowledge. The glass ceiling begins in elementary school. “Even though the stereotype equating brilliance with men doesn’t match reality, it might nonetheless take a toll on girls’ aspirations and on their eventual careers,” observed Cimpian, the paper’s senior author. The studies in “Gender Stereotypes About Intellectual Ability Emerge Early and Influence Children’s Interests” were undertaken to examine the age at which brilliance stereotypes begin to arise. In one task, the children were told a brief story about a person who was “really, really smart.” Children then viewed pictures of four unfamiliar “targets” (two male, two female), and were asked to identify the protagonist of the story. All of the “targets” were deemed to be of similar attractiveness and dress to avoid potential subtle bias. In some studies, all targets were adults whereas in other studies, the targets were pictures of adults and/or other children. The results did not differ significantly by whether children rated adult versus child targets, and were similar across various socioeconomic and racial-ethnic backgrounds within the study. In other tasks, the children saw several pairs of same- or different-gender targets and guessed which person was “really, really smart” or “really, really nice.” Common stereotypes of being “smart” and of being “nice” are traits that are frequently differentially linked to gender, and could provide further information about the age at which stereotypes develop. The results showed that both boys and girls aged 5 viewed their own gender as intelligent. But girls aged 6 and 7 were significantly less likely than boys to associate brilliance with their gender (Figures 1A, 1C). The stereotype associating females as being nice follows a similar development (Figures 1B, 1D). In both studies, the results suggest that children’s ideas about “brilliance” and “niceness” exhibit rapid changes from age 5 to 7. Thus, the stereotypes that “brilliance = males” and “niceness = females” may already be embraced by children as young as age 6. Next, the authors investigated whether children’s gendered beliefs influence their activities and interests. In the next studies, children were introduced to two games, one said to be for “children who are really, really smart” and the other for “children who try really, really hard.” The content and rules of both games were very similar. Children were asked four questions to measure their interest in these games (e.g., “Do you like this game, or do you not like it?”). 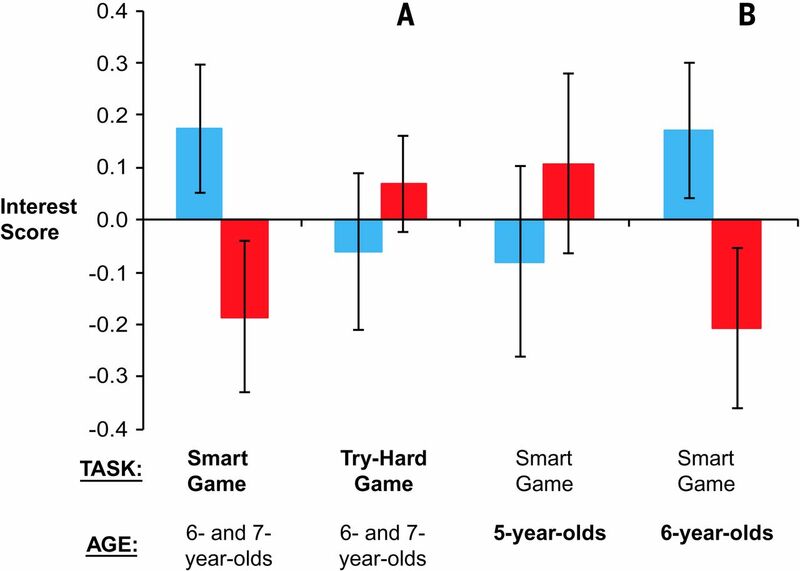 Girls at 5 years of age showed interest in playing the smart game, but at age six, exhibited a markedly decreased interest (Figure 2B). In contrast, both genders exhibited similar interests in the try-hard game, with girls expressing a slightly greater interest. Combined with additional tasks, the results indicate that young children’s emerging notions about intelligence guides their decision regarding which activities they want to participate in. Indeed, if these attitudes alter a child’s activities during elementary school, and science is stereotypically considered “for really, really smart people” rather than for people who “try really, really hard,” girls become increasingly unlikely to engage in activities that will lead them toward an interest in, and readiness for, a scientific career. Paper 2: Motivation to Pursue Science Determined by Gender? decision to pursue the study of science, regardless of nationality and other social factors. 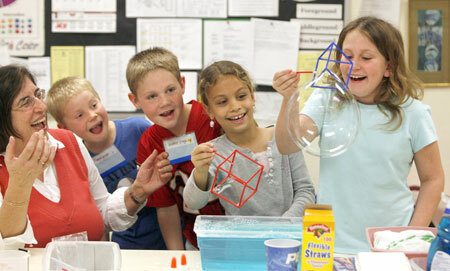 Engaging older children in science becomes increasingly harder. So what does motivate boys and girls to pursue science? Figure 3 reveals the scientific topics that most interest boys versus girls, according to one survey. While the stereotype of boys liking explosions may make us chuckle, it is clear from this list that we must become aware of how we interact with and motivate even the very youngest people in our spheres. Both genders are equally adept and capable, and we must become better at nurturing individual motivational differences in the youngest children to bring out the best of their abilities — whether they are science-focused or not. The Role of Gender in Asking Questions Women in science: on “Science: It’s a Girl Thing!” and “My Fair Physicist? Feminine Math and Science Role Models Demotivate Young Girls.” The Next Generation of Astronomers What Women Want? Was this study “The 5 top ranked items boys and girls would like to learn about in science. [Jenkins & Nelson 2005]” conducted on boys and girls whose preferences had already been skewed? I have had 15 years of experience with after school programs in Astronomy, Cooking Science, and Gardening Science. These programs have been with 8, 9, 10, and 11 year old elementary and middle school kids and special needs high school kids. I agree with a lot of the observations made by this bite but have additional perspectives I have seen first hand. Firstly, I am male and have been categorized as good but not necessarily nice – this is somewhat purposeful. I have had a few women categorize this as sad – now who is being stereotyped! I had a feminist relative who spent large amounts of time successfully stimulating my interest in science which was obvious by the time I was 6.By the time I was eleven, my nick-name in school was the “brain”, I did not accept this moniker until I was 15 as it became obvious to me that I was exceptionally smart. People then started to expect superior performance from me which exceeded my motivation – this led to failure often. Later, I finally figured out that motivation was my weakness and have spent considerable effort since motivating myself. In teaching young people, I find myself identifying with young people that exemplify characteristics that I see in myself and take pride in – I have purposefully become mentors to these youngsters, almost exclusively female .and not white. I answering young male questions about the end of the earth ( red giant phase of our sun, black holes, collision with Andromeda, etc.) I find the answers exclusively frightening to young females – their concern extends to future generations and not necessarily themselves – I find I must fully explain that 4 billion years is nothing to worry about. Size concepts, nebulae being 10 light years across and galaxies being 100,000 lights years across, also more difficult if not impossible to get across to females. I have had more difficulty with the religion vs. science conflict with females as well. I do my best in dealing with these differences with considerable success. Many times, that my success is expressed in affectionate terms by young women and I must resist their physical urges to hug me. This is not easy or fair. More like painful, to be frank. A few of the females that I have mentored have exhibited considerable courage venturing into advanced areas without hesitance – I find they resist the label. The ones I see exhibiting problems solving ability do not resist being identified as such. The smartest have been labeled by others so I do not use that adjective, boys or girls. I see considerable difference between science and engineering and express myself in skeptical science perspectives. Some students identify with my experience at being good at math but not necessarily liking it – they feel good about not being alone in that regard. I feel good about myself and how I teach – I see considerable moderation regarding this male/female stereotyping – although most is very recent. I would suggest this study must be updated regularly to reflect the rapid change I see happening. I hope I am part of that process.